I cannot believe that we are nearing the end of this 10 week long journey. I remember our first class like it was yesterday. These two strangers were in the classroom when I arrived. When the bell rang they started talking to us about philanthropy, what is is, how it works, and so much more. Then they got into the details, explained how we would be raising money for an organization, how there was an initial donor, and how at the end of this journey our team would be presenting the organization of our choice with one of those huge checks you always see in pictures. I remember thinking to myself “That is so awesome! I cannot wait for that day.” I remember running home after our first class, so excited to tell my mom about the journey we were about to embark upon and of course the part with the huge check! As the classes progressed we learned so much about what philanthropy is. We learned how to be a philanthropist, how to read 990 forms to see if an organization is able to function financially and so much more. It was very fascinating. Everything I learned during our classes will be useful once I enter the real world. With these past nine weeks behind us, those two strangers who appeared in class on day one are no longer strangers, they are mentors. They have taught me how to truly have an impact on my community. They are making a difference in our world. Which brings me to what we did today. Today was absolutely amazing. When we left school this morning I really was not sure what to expect. When we arrived at the Quantum House, the volunteers were so welcoming. There eyes were so bright and you could feel their excitement and appreciation. Allowing us to hear from a family staying at the house was one of things that stood out to me the most from this day. Hearing there story made me realize that what the Quantum House is doing is changing the lives of people receiving serious medical care in our area. Hearing this story really made me feel sincere in our option to donate our money to them. They truly our a working example of our teams mission. As we moved onto the other sites it was so fascinating to my eyes. I was never aware of all the people in our community who volunteer so generously. There is such a variety of organization, working to achieve different goals, but all with the same mission. Every single one of these organizations is here to help people. Most often, these organizations do not know the people the are serving, but they serve out of the kindness of their hearts, which is pretty amazing. Seeing the final dollar amounts almost blew me away. I still remember hearing that we had to raise $300 on day 1. That seemed so difficult to me because I had never experienced anything like this before. Seeing the huge check with the total amount raised was amazing. I cannot believe that we donated over $3ooo. All in all, I could not have been more happy with the experience I had with this course. I believe that I learned so much information that I will be able to use in my life. I am so thrilled that I got to be one of the guinea pigs for the first Main Street Philanthropy course at Oxbridge. 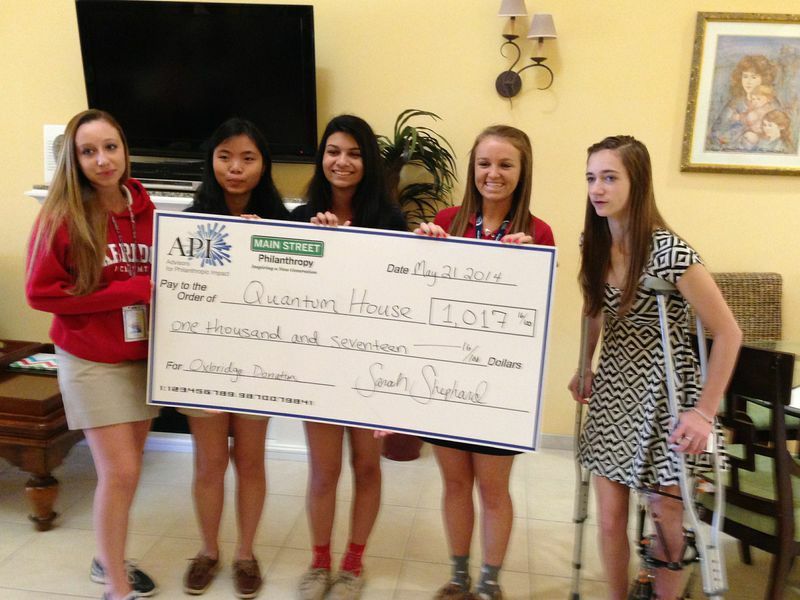 We have decided to donate the money we raised to the Quantum House. Team Healing HeARTS came to its final decision on a qualitative manner. After the panel discussion we were really able to see the kind of work they do at the House. The amount of families they are able to touch and serve during difficult moments in their life is unparalleled. When Ms. Roberta shared the stories about families connecting while living at the house was heartwarming. Two families where staying at the House while a child of theirs was in the hospital. The two mother’s were washing laundry when the one started to say how she doesn’t know why such a thing would happen to her family or how she was going to lived like this. The second mother began to comfort her and told her to look at her son. When he first got sick she felt the same way. They have had to adjust, but her and her little boy are doing okay. She told the mother that life is going to be different, but it is still going to be great. The mothers had formed a bond during that moment and while during their stay at the Quantum House. She added that the two families are still in touch and both are living their lives happily. Stories like this are what pulled us in. If we can help create more happy endings like this then we will do all we can to make it happen. The Quantum House is also financially stable, which is a bonus. However, the final decisions as based off of the quality of work they do at the House. All of the funds we raised will be given to the Quantum House and we will allow them to use the money towards what they think is appropriate. It has not been the easiest thing to work with a group on a project like this. We hit a few rough patches in the beginning due to lack of communication, which made it difficult to make team decisions. We planned fundraisers that never happened, shared awesome ideas, none of which happened. However, after some discussion, we were able to work out the issues and became stronger as a team. We all worked better to communicate with one another. We made sure that our fundraisers happened and that they were successful. As the project begins to dwindle down, I can happily say that we reached our goal and became a powerful group. I believe that next week is going to be an amazing experience. I have never been able to donate to an organization in such a manner. I am confident that all the organizations that we are donating to will be thrilled. I cannot wait to present the final check and see how much money we were able to raise as a class. Interviewing a family member was rather interesting. I chose to interview my older sister. The reason I chose to interview her is because she is in college and I thought it would be a fun and interesting experience. I really enjoyed her answer for the question concerning what young people should know about money. She shared that money does not grow on trees. It is something that you need to work for and earn. Learn to establish a budget were you are allocating money to various things needed: i.e savings, food, living, fun stuff, etc. Learn the difference between want and need. I thought that creating a budget was a useful and realistic piece of advice. As I go to college in just two months money is going to be limited. In order to manage, I will need to create a budget for myself. I had never really thought to do this before. In addition I was intrigued by what serious problem she would like to fix. When I asked her this question she knew immediately what she was passionate about. She believes that we need to care more about children in foster care and in orphanages. These children do not get to decide the life they are born into. She believes that every chid deserves a chance. Everyone should have equal opportunities in the world and we should all have someone who loves us. I never would have thought of such an idea, but I liked hearing her thoughts about this concern of hers. From our conversation I learned that it is important for individuals to work together in life. In addition, I learned that as you grow up and transition into being an adult and supporting yourself, it is important to stay on a budget. You need to learn to spend money on necessities so that you can have money to share with charities or foundations that are important to you. This was a fun experience and I really enjoyed it. My sister did not know what she was in for when I called her, but we ended up having a great conversation and I was able to learn a lot about her values in life. I grew up in West Palm Beach. From what I can remember, as a kid, things were much less developed then they are now. The Wellington Mall did not exist and living in Wellington was like living out in Belle Glade. Many roads were lined with trees. As I have grown up, the population has migrated westward, buildings have shot up, and life is a lot busier now then it was when I was younger. An experience that changed my life would have to be when my dad was diagnosed with Diverticulitis a few years ago. This was a very stressful time for my family and I was able to learn that everything happens for a reason and that you cannot take things for granted. Anything can happen at any time. I also learned to be prepared for anything that life may throw my way. We will experience tough times, but if we believe we can overcome them, we surely can. Staying positive and hopeful are definitely key. From what I remember as a kid my parents made the family financial decisions together. They sent us to private schools and provide us with what we needed. My siblings and I did not receive an allowance and we had to work for everything. We were not just given everything we wanted. As I grew older I started babysitting and finding ways to make my own money, which helped me be able to buy things I wanted. Now that I am in college, I am on a budget. My parents send me some money, but for the most part I support myself financially with the money earned from my two jobs. My parents still pay for my car, all insurances, and other important things. I pay for things like gas, food (not at college- eating out), clothes, and other fun things that are not necessary. Money does not grow on trees. It is something that you need to work for and earn. Establish a budget were you are allocating money to various things needed: i.e savings, food, living, fun stuff, etc. Learn the difference between want and need. Charitable giving and community service have given my life more value. They have helped me learn to appreciate everything I have and they have helped me learn the importance of helping other people. Both valuable lessons for life. It is important for the young people of today because we are all citizens and we need to work together for the bettering of everyone. We all have responsibilities as members of our communities and it is important that we fulfill these duties. A problem I would like to fix in the world today is adoption. This is important to me because these children are vulnerable and they were born into situations that they did not choose. I feel that it is only fair for them to have a chance to live a good life and to feel wanted and loved. I made a meaningful difference in my school community as a Resident Assistant. I was able to assist my residents and help them with questions and problems. I also helped make my residents feel welcomed and to enjoy their experience in on campus housing. I made sure to be flexible and friendly and to always put the needs of my residents first. Our class last week was a lot of fun. I really enjoyed getting to hear more about the different non-profits our class is working with. Ms. Roberta, from the Quantum House, shared information with us about what the house is about. It was wonderful to hear the stories about the friendships and connections that have come out of the house. I could see the success the house is doing just through the stories Ms. Roberta shared with us. While they are not on a huge budget and only have limited room for families to stay, they still accomplish a ton. They help families whose children are undergoing medical treatment feel more at home, providing living quarters, food, laundry rooms, and so on. Their goal is for the families who are there to have money be their last concern. The Quantum House shares a similar Mission, Purpose, and Vision with our group. It is financially stable and are under great leadership. Team Healing HeARTS is excited and eager to continue working with the Quantum House. We cannot wait for the day that we get to present them with a check of the money we have raised. Moving on the he fundraising side of things, we are moving along great. 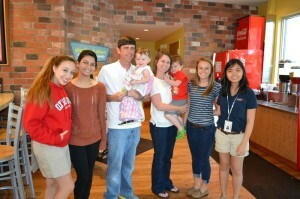 Our first fundraiser was a Family Fun Night at PDQ. We had a great turn out and in turn raised just about $200. We have two other fundraisers coming up; a garage sale and a Pampered Chef show at the Quantum House. In addition, we have a potential fundraiser that may come about, but is not set in stone yet. However, at this point in time we are feeling pretty great! Team Healing HeARTS with a family who is currently staying at the Quantum House who showed up to our fundraiser! This past class was great! We spent some time discussing how well the groups are all doing, what teams have done to work on fundraising, and so on. Basically, we all got caught up since it had been so long since we last met. After that, we went in to talking about the organizations that each group has reached out to. We spent time looking at the 990 forms for the organizations and then filling out our books that help us determine how successful each organization is. After looking at the forms and doing the numbers for three organizations, the Quantum House, Joe Dimaggio Children’s Hospital, and Miami Children’s Hospital, we decided to focus on the Quantum House. Although they were not necessarily the safest bet, financially speaking, they are local and the work they do is significant. Towards the end of class we went around the room and had each class member share their thoughts so far. Did they think their team was working well together? Is one person doing majority of the work? What could your team improve on? The consensus was that each team needs to work better on communication. We all have these great ideas, whether it be for a fundraiser or for a charity to work with, but we are not able to get them across to each other. As a group we decided to try and improve upon this. So far, my group has been better at communication. We have managed to set up a fundraiser next Monday, April 14, at PDQ. It is a family fun night. There will be raffles, food, and fun. 10% of the proceeds that night will go towards our fundraiser to the Quantum House. Please join us! !